July 19, 2018 – A trench collapse occurred in the borough of Bound Brook trapping a worker up to his waist. 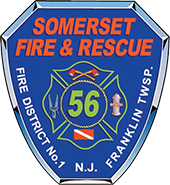 The Franklin Township Technical Rescue Task Force (Station 56, 25, 26) was requested. Chief 56, Special Ops 56 and TRT unit responded with the other task force units to the incident. The victim was removed from the trench and transported to a medical facility. No further information is available.